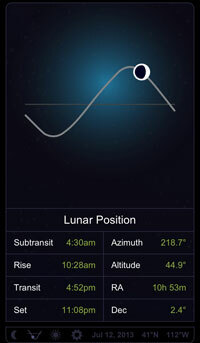 Luna Solaria is a new mobile moon app for iPhone and Android devices. Luna Solaria is immediately ready to use after installation and is designed for efficient use. Easily swipe to reach each screen, or click on convenient icons. The app automatically configures your location by using your phone's geographic location. 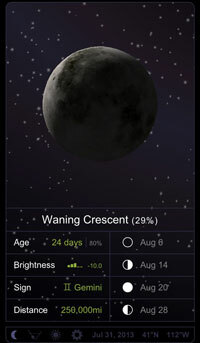 The app uses precise mathematical algorithms accurate to less than a second (when compared to sources like US Naval Observatory, differences are a minute or less because such sources round figures to the minute). Specific features you'll find are listed below. All data is live (real-time), calculated based on your current time and location. 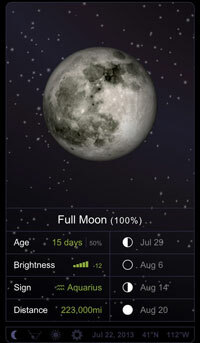 Note: If you have a Windows desktop computer and are looking for MORE moon details, take a look at QuickPhase Pro (opens new window).